LONDON, England (CNN) -- Aircraft manufacturer Airbus is ready to fund a third search of the Atlantic Ocean if a second search, now under way, fails to find debris from last month's Air France crash, the company said Friday. Investigators pore over wreckage of Air France flight 447 which crashed killing 228 people on June 1. Airbus is discussing a payment of between 12 to 20 million euros ($17-28 million) to help pay for a third search, but it is still too early to settle on a figure, company spokesman Stefan Schaffrath said. "We are ready to give a significant share, whatever is needed," he told CNN. The company is driven by the desire to understand what caused the crash of Air France Flight 447 on June 1, he said. All 228 people aboard were killed. "Our priority is increasing aviation safety," Schaffrath said. "The aviation community can learn from an accident." Airbus is already helping in the second search alongside Air France and the French accident investigations agency, the BEA. French investigators began the second phase of their search for remnants of the flight Thursday, weeks after the locator beacons of the plane's flight recorders would have stopped working. A ship arrived in the area of the Atlantic considered the most likely location of the flight data recorder and the cockpit voice recorder, according to the BEA. Using two submersible units and lateral scanning sonar, search teams will look for debris sites on the sea floor that could lead to finding the recorders, the BEA said. The locator beacons of flight data recorders and cockpit voice recorders are designed to emit acoustic beacons, or "pings," for 30 days after a crash. Flight 447 went down in stormy weather during a flight from Rio de Janeiro, Brazil, to Paris, France, on the first day of June. The search for the pings ended July 10. Investigators hope the recorders will help them determine the cause of the crash. 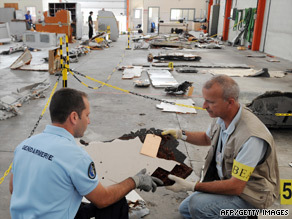 Flight debris recovered so far is being stored in France, authorities have said. Only 51 bodies were recovered from the crash of Flight 447, the worst accident in Air France's 75-year history.